An all-important upgrade or an exercise in incrementalism? When AMD rolled out its chips for the new AM3 CPU socket, we were bafﬂed. AM3 dragged AMD into the DDR3 era. But with that in mind, why were the ﬁrst AM3-compatible CPUs groveling models with cut-down caches, lower frequencies or fewer cores? Surely the new socket deserved a brand new processor to showcase its beefed up bandwidth and multi-core majesty? Finally that chip has arrived in the form of the new Phenom II X4 955 Black Edition. For those of you without a double ﬁrst in cryptography, allow us to decode the ludicrous product name. For starters, it's a Phenom II chip and that means cool-running, high-clocking 45nm silicon and hence not AMD's utterly rubbish 65nm transistors. X4, of course, indicates four cores, which is as good as it currently gets. 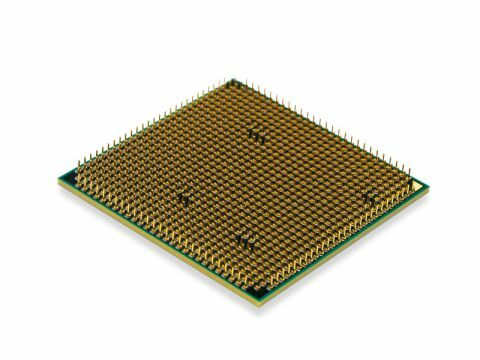 Then there's the 955 which has several meanings, most signiﬁcantly a 3.2GHz operating frequency, the aforementioned AM3 socket compatibility (as well as backwards compatibility with AM2 and AM2+ mobos) and support for DDR3 memory up to 1,333MHz. Finally, this is a Black Edition chip, which sports an unlocked CPU multiplier. All of which leaves the minor matter of performance. The key yardstick is AMD's previous uber CPU, the 3GHz Phenom II X4 940 Black Edition. Needless to say, at stock operating frequencies the additional 200MHz doesn't translate into an epic increase. Likewise, the additional bandwidth of DDR3 memory compared to the DDR2 in the old 940 won't have you running victory laps around your desk. What you do get is an incremental improvement over a chip that already delivered extremely satisfactory performance. In that context, the 955's overclocking prowess is more interesting. The news here is mixed. Running at stock voltages, our sample tops out at 3.6GHz. That's around 200MHz more than the old chip and therefore in line with the ofﬁcial frequency boost. However, our initial efforts at increased voltages hit the wall at 3.7GHz, which isn't higher than what we achieved with an overvolted 940. No doubt with more time spent tuning the chip's voltages as well as the northbridge, we could squeeze out a few hundred additional MHz. But then you could say the same thing about the 940. Nevertheless, we prefer to run CPUs at stock voltages and there the new 955 compares more favourably. It'll run all day long at 3.5GHz. Whether that's worth an extra £50 over the 940, however, is another matter.